In the fall season, pumpkin spice flavors vary from product to product. Pumpkin spice, pumpkin flavoring, pumpkin pie or just the color orange has become the staple of fall and surrounding months. Orange has taken over the country with snacks and treats popping up everywhere. One step into a grocery store, and the smells of pumpkin spice and cinnamon are wafting around. Grocery stores now have full sections dedicated to fall-themed items. These items can range from snacks and candy to pumpkin-flavored drinks. One of these sections had things such as dog treats and tea thrown together because of the pumpkin flavoring they have in common. One question most have for this trend is whether all the hype for pumpkin is worth it. One of the more redundant “treats” is pumpkin spice cream cheese, which at first glance is confusing in why it needs to exist. I was very hesitant in trying this because of how it looks, smells and it’s overall appeal, which isn’t very strong. The taste itself was surprisingly mild and tasted more of cheesecake then actual pumpkin spice. The cream cheese is a more extreme case of a company trying to be part of the fall trend. 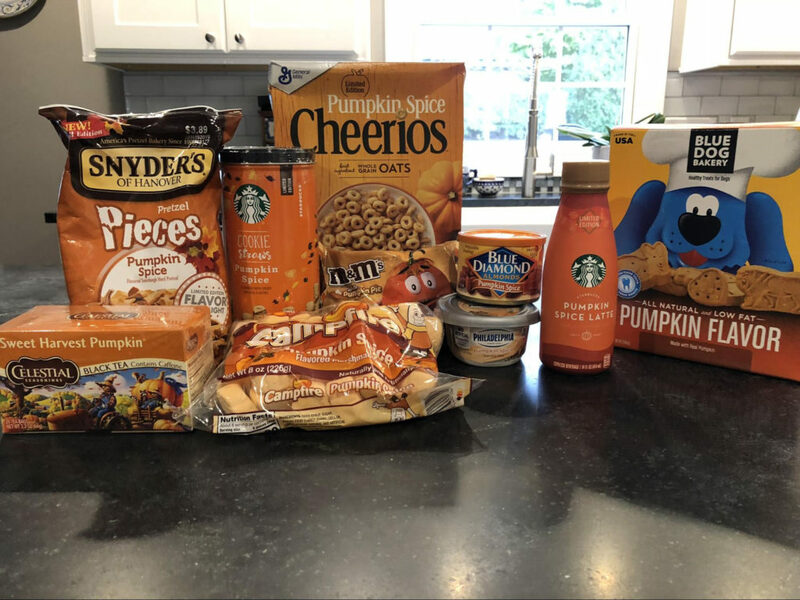 Another product I found to be confusing was the pumpkin spiced marshmallows, which looked disgusting but were explicitly placed with the rest of these items, so they had to be tried. They were orange and had a bonus because they are shaped like pumpkins as well, so they fit all the criteria needed to be fall-themed. They tasted bland, and the texture was very grainy. The attempt was there, and there was a hint of pumpkin in them, but, overall, they just tasted like marshmallows. The final product I found surprising was the pumpkin M&M’s which seemed relatively normal considering all of the many different flavors of M&M’s, but I found this flavor and item, in general, to be the worst one out of the many odd foods I tried. At first, these seemed like normal fall-flavored treats, and they even smelled the same as well, but what threw off the whole thing were the different flavors that I could taste in the M&M’s. They mostly tasted like white chocolate and then transitioned into a lingering and mild pumpkin and cinnamon taste. This combination doesn’t seem too out of the ordinary, but together they tasted pretty bad with an aftertaste of rotten milk. In conclusion, pretty much all the items tasted the same, looked the same and had the same overall appeal. Companies are trying to come up with things to add on to the trend that will stand out, by creating things that sound weird enough for people to try, and in partnership with the many grocery stores they’re sold at, they can advertise like crazy. All of these items fell short in the same way. They ended up tasting the same, which counteracts the entire gimmick of pumpkin spice.